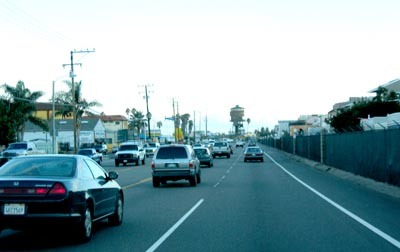 Driving down the Pacific Coast Highway on the way to Chaz & Linda’s. A nice drive though I started later than I thought. Spent time hanging out in L.A. doing some shopping, went into Fry’s Electronics were the ceiling was leaking water in about a dozen spots. They were having a hard enough time dealing with water leaking in an electronics store so I didn’t feel right adding to their misery by shooting photos of them squeegeeing water on the floor and cardboard laid everywhere to prevent people from slipping on the wet floor and sopping up water. Pretty bad. It’s been raining here in SoCal off and on. 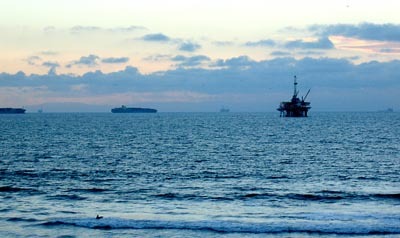 Offshore ships and rigs seen from PCH off Long Beach. You can see seagulls and pelicans all along the shore area. You just about never see seagulls in Hawaii. Seagulls and Pelicans can’t process salt water so they can’t fly to Hawaii though we do have migratory seabirds in Hawaii along with the usual birds. 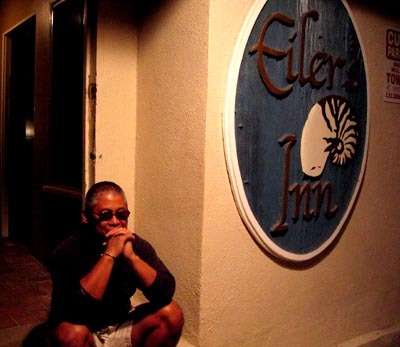 By the time I got to Eiler’s Inn it was getting dark and Chaz and Linda were wondering where I was when I finally pulled-up. Here Chaz hangs out with me behind the inn, talking-story and catching up on old and new times.